While the espresso alfajore ice cream was very delicious, I think that the recipe I’m sharing with you today is even better! I really wanted to transform a traditional South American recipe using Nespresso’s Cauca capsules. Technically, brigadeiros are Brazilian (and usually served at birthday parties), but they are so easy and I felt certain that the espresso would bring the classic brigadeiro to a new level, as coffee brings out the taste of chocolate so well. This is the new cute and tiny Inissia machine that Nespresso loaned me to create some new recipes. 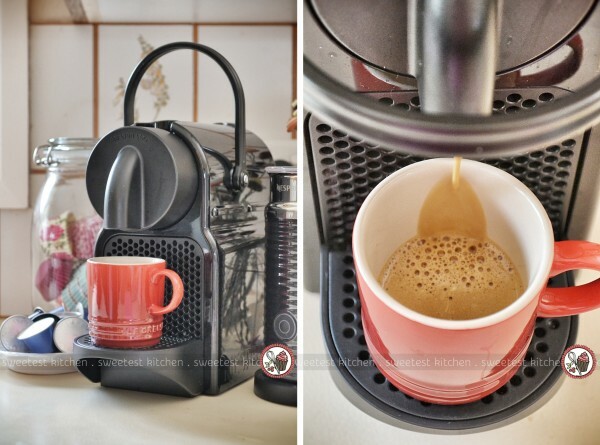 I don’t actually own any Nespresso machine (any loyal reader would know I’m a coffee-presser at heart! ), so this was really generous of them. Luckily, I have a friend who gave me a handful of other Grand Crus (the blue capsules in the photo above) so I’m not only making espresso for recipes, but also to drink! My espresso brigadeiro recipe starts with one freshly extracted capsule of Cauca that has been allowed to cool to room temperature. In a small saucepan, combine one 395g can of sweetened condensed milk, one teaspoon of slightly salted butter (or unsalted butter, plus a pinch of sea salt), one teaspoon liquid glucose (or light corn syrup), 4 tablespoons of sifted cocoa powder and the cooled 40ml espresso. Give it a stir, then heat it on the stove for 10-40 minutes, stirring constantly. The time it takes to cook will be dependent on the heat and type of pan you’re using. 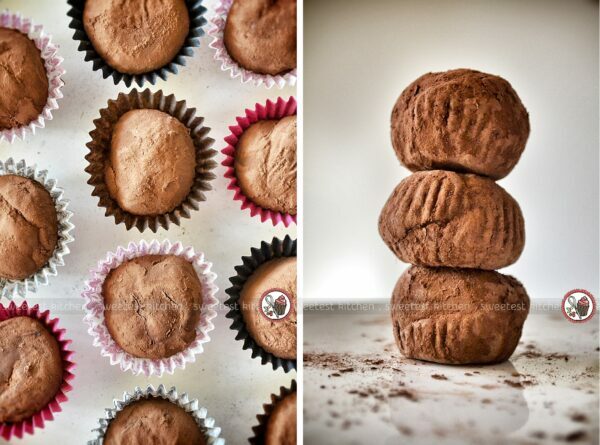 The key to this recipe is knowing when the brigadeiro mixture is done. It needs to be really, really thick. When you cut the mixture with your spoon across the bottom of the pan, the mixture will very slowly come back together, or using your spoon, scoop up a spoonful and turn it upside down; it should very slowly start to drop out of the spoon. This video from Street Smart Brazil should give you a good idea as to what the consistency should be (it’s around the 7-minute mark on the video). When you’ve got the right consistency, transfer the mixture to a shallow plate or bowl, and you may want to give it a rub with a little bit of butter beforehand so it won’t stick when you go to roll the mixture into balls. Let it sit until cool and firm. This is the fun part – grab a small chunk of butter and rub it on your hands. Use a spoon and scoop up about a tablespoon (I used a digital scale to measure each brigadeiro at 25g) and roll it into a ball. You’ll absolutely need the butter on your hands, you’ll discover, as the mixture will be impossible to roll without greasy hands! 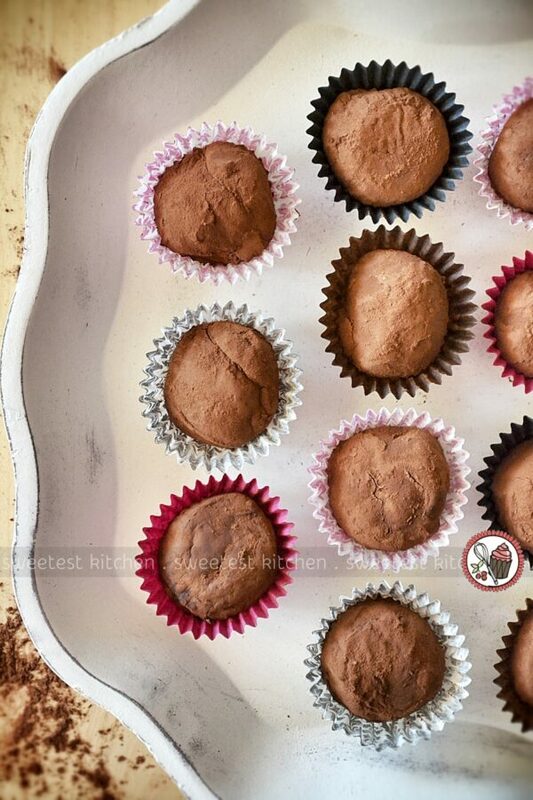 After rolling the mixture into balls, you’ll need to roll them in a bowl of sifted cocoa powder (or chocolate sprinkles, as is more traditional). 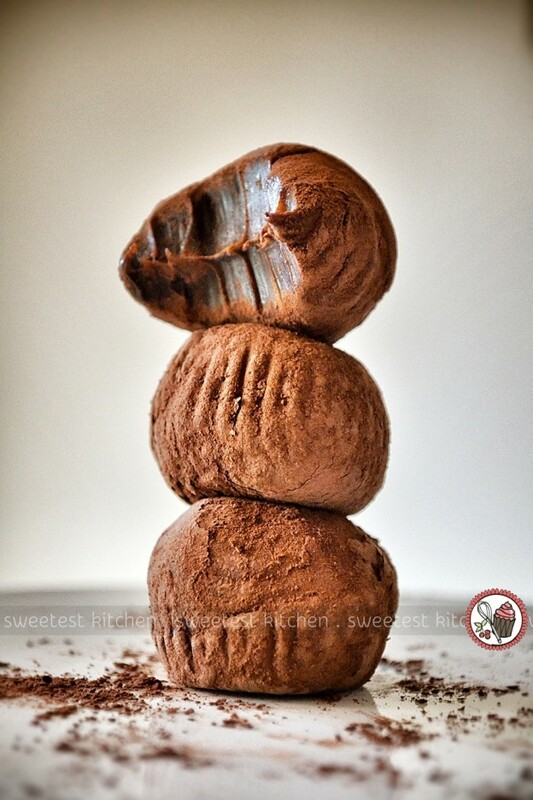 I like the slight bitterness of the cocoa powder, however, with the sweetness of the brigadeiro. My brigadeiros are not perfectly round, but I wasn’t aiming for perfection; I’m more of a rustic kind of gal! Also, the day was warm and the heat kept the mixture a bit soft which left indentations of the baking cups in them, as you see in the photos of the stacked brigadeiros. So, how do these little guys taste? Amazing! They are super chocolaty with a sublime background note of the Cauca espresso. The texture is like a soft, chewy caramel. They are just stunning, I loved these so much! No wonder the brigadeiro is a feature at every Brazilian birthday party! I think I’m going to have to bring this tradition to Australia, as it’s the perfect excuse to indulge in these delicious morsels! 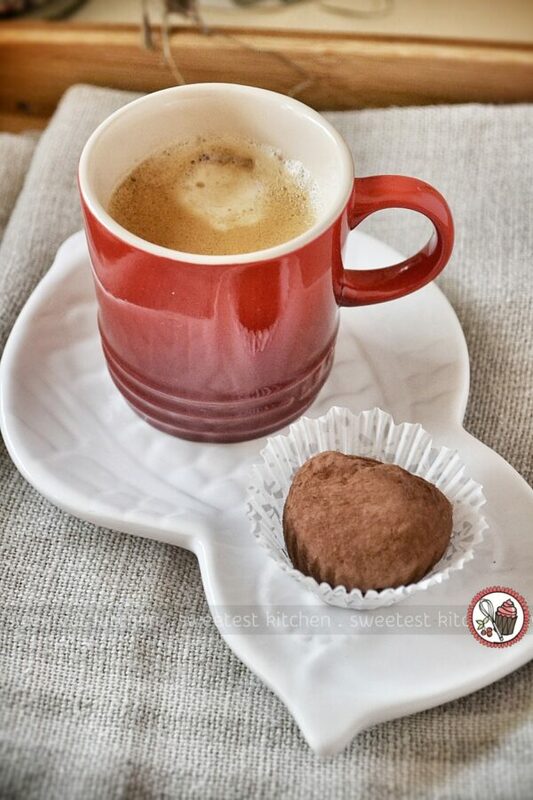 And even though my brigadeiros have their own hit of espresso, they are wonderful with a cup of coffee as well! Traditional Brazilian brigadeiros are taken to a new level with the addition of Nespresso's new limited edition South American Grand Cru, Cauca. In a heavy-bottomed saucepan, combine sweetened condensed milk, butter, liquid glucose, 4 tablespoons sifted cocoa powder and espresso and stir until combined. Place on the stove and heat to boiling, stirring constantly. Reduce heat to low and stir constantly for 10-40 minutes. The length of time will depend on the heat and type of pan used. The mixture will be ready when it very slowly comes back together when cut with a spoon across the bottom of the pan. Transfer the mixture to a shallow plate or bowl that has been rubbed with a bit of butter to prevent sticking. Set aside and allow to cool, about 30-40 minutes. The mixture will continue to firm up. Rub hands with a bit of butter, scoop out a tablespoon (I used 25g for each brigadeiro) of the mixture and roll into a ball. 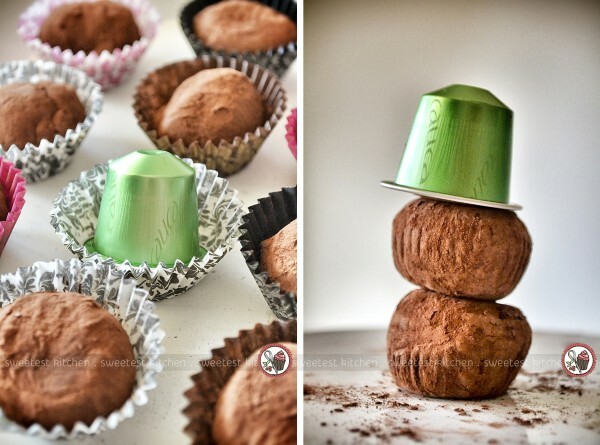 Toss the brigadeiro into the ⅓ cup sifted cocoa powder, tap off excess cocoa powder and place into a mini baking cup. Repeat until the mixture is used up. Serve immediately. Can be stored in an airtight container up to 3 days in the refrigerator, but the coffee flavor won't be as strong. * If you don't have slightly salted butter, use unsalted butter and add a pinch of finely ground sea salt. * You can use light corn syrup instead of the liquid glucose. I love it! 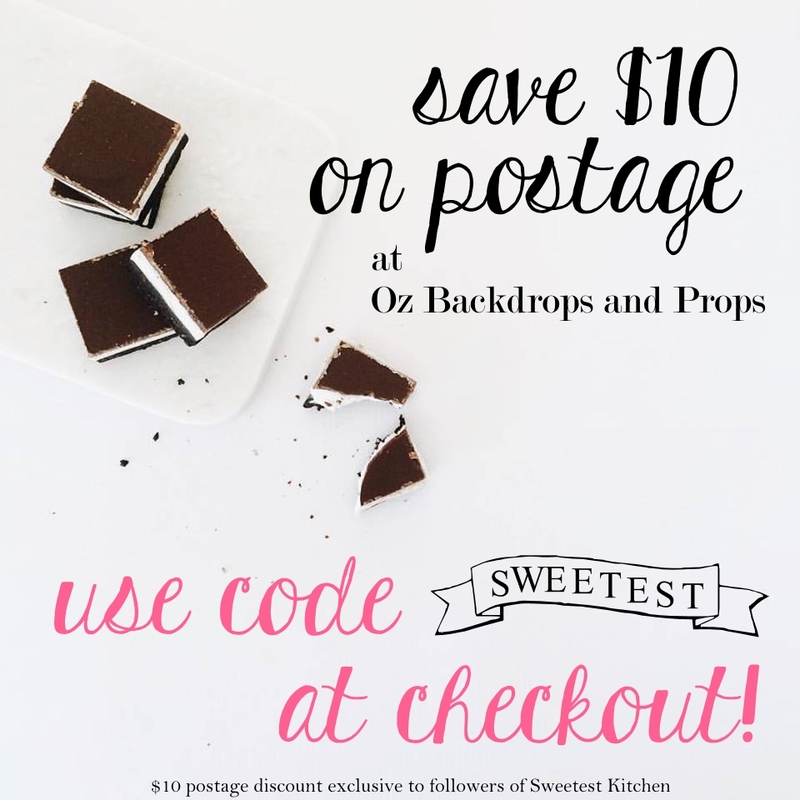 I am a Brazilian small Brigadeiro owner in Sydney and would like to introduce you my Gourmet version of brigadeiros!!! I love it! What a perfect combination! Yummy brigadeiros!